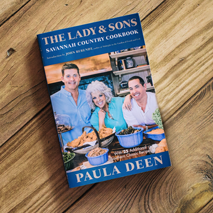 This book is a celebration of family, food, and true Southern hospitality. Whether you’re sitting down to Sunday supper, planning a party, or headed to a potluck, you will find the right recipe within these pages. From breakfasts and breads to soups and sandwiches, as well as entrees, casseroles, appetizers, and desserts, the dishes here are ready and waiting for you. Each of the 150 easy-to-follow recipe is accompanied by a beautiful photograph so you know exactly how the dish should look. For the first time in a book Paula includes easy meal menus to assist with planning plus three perfect themed gatherings not only providing the recipes but also how to serve and decorate. 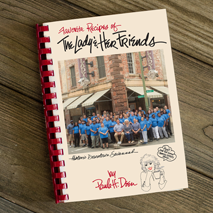 This book celebrates the 20th anniversary of the publication of Paula’s first self-published cookbook Favorite Recipes for the Lady & Her Friends. This collection of over 390 recipes from Paula’s recipe box, with contributions from family and friends, include 150 delicious recipes that have never appeared in any of Paula’s other books. Paula hand picked each mouthwatering recipe and had an illustrator re-create her personal stories. In a new introduction Paula reflects upon the past twenty years and to the surprise of her sons Jamie and Bobby Paula included a tribute to her sons. This fun homegrown cookbook will be a wonderfully quirky addition to any cook’s kitchen. The Lady & Son’s, Too! 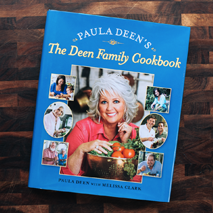 A revised edition of Paula’s classic cookbook containing 340 recipes. The classic Chicken with Drop Dumplings, Savannah Gumbo, Tomato Casserole, and Old-Fashioned Fudge Pie are joined by 25 new recipes destined for greatness, including Slow Cooker Apple Onion Soup with Cinnamon Cheese Toast, Buffalo Chicken Po’boys, Chicken Noodle Casserole, and Red Velvet Biscotti. Paula also includes 32 very helpful hints to save you time and money, an no one should step into a kitchen without reading them. 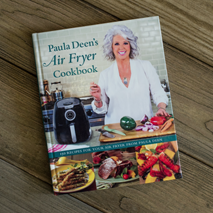 Paula has converted 150 of her delicious recipes for the air fryer: portions, instructions, and cook times have been adjusted to create perfect meals. Chapters include appetizers, sides, poultry, seafood, meats, and sweets. Paula’s favorite chapter the ode to the potato is a full chapter dedicated to one of Paula’s favorite vegetables. Recipes include Air-Fried Mac and Cheese, Buffalo Chicken Pinwheels, and Bacon-wrapped sausage stuffed Jalapeños and Air-Fried Asparagus with Herbed Lemon Aioli. Introduction by John Berendt, author of Midnight in the Garden of Good and Evil. 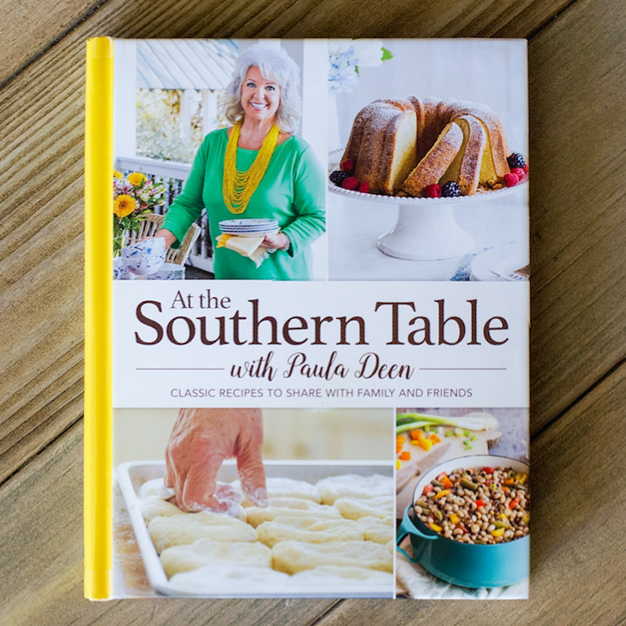 This reissue of Paula Deen’s first and best-selling cookbook proves that true Southern cooking never goes out of style. 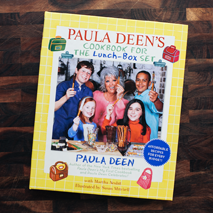 Paula has added 25 recipes to her classic collection of down-home Southern family favorites, including Paula’s famous Chicken and Waffles, Ove-Fried Catfish, Savannah Sloppy Joes, and Sweet Blueberry Corn Bread. 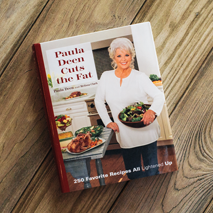 Featuring 200 new healthy Southern recipes and lighter versions of 50 of Paula’s favorite dishes – perfect for anyone who wants to lose weight, control blood sugar, lower high cholesterol, or just serve healthier meals to their families. With over 416 pages and 250 mouthwatering easy-to-follow recipes: Paula’s cooking tips sprinkled throughout: and lots of photos of food, friends and family; this book is a must have. 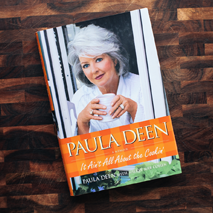 In this 480 page book Paula shares a generation’s worth of stovetop secrets. 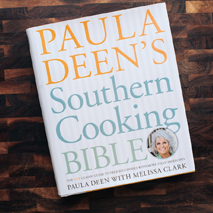 With 300 recipes, each dish will be a mouthful of one-of-a-kind Southern spirt and traditions. These recipes showcase the diversity and ingenuity of Southern cuisine, from Cajun to Lo-Country and beyond highlighting the deep cultural richness of gumbo and collards, to barbecues and pies. Includes nearly 100 instructional illustrations, an extensive appendix, 16 pages of gorgeous color photography, and plenty of tips, stories, and Southern history throughout. Paula invites you to take a photographic journey of beautiful Savannah, Georgia. In this gorgeous coffee table book Paula provides a tour of her home, her friends beautifully decorated houses, and some of her favorite places including Savannah’s lush gardens, townhouses, and sprawling plantations. Pages are filled with decorating and entertaining tips for each season. 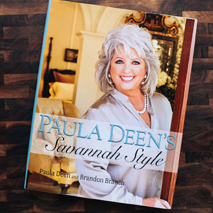 Savannah is the epitome of old Southern Style and the Savannah lifestyle ideas in this book can be used in your own home no matter where you live. Nothing is more important to Paula Deen than her family, and nothing makes that big family happier than sitting down to a meal together. With more than 140 recipes and dozens of beautiful color photographs, there’s something here for everyone. So invite over all those aunts, uncles, cousins, and friends, and treat them to some home cooking, Deen family style. When the school and work days end, what better way to connect with your family than by cooking in the kitchen? And when the school bake sale calls for volunteers or you need ideas for your sleepover party, this book has the simplest most delicious recipes for the fun activities that happen all school year long. Paula has included a measuring guide and a cooking glossary. Easy-to-follow recipes and fun illustrations throughout. With fun illustrations throughout Paula’s first children’s cookbook is full of tasty recipes, each one easy enough for tiny hands to assist. Kids of all ages will enjoy learning to make everything from Mother’s Day breakfast to Father’s Day dinner. 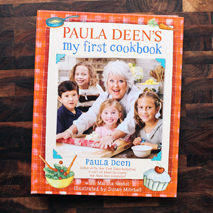 Paula includes kitchen safety tips, a children’s cooking glossary, How to set a table, and a guide to good manners. Get in the kitchen with your favorite little ones today and start making memories. Do you know the real Paula Deen? You may think you know the butter-loving, finger-licking, joke-cracking queen of melt-in-your-mouth Southern Cuisine. You may have heard some version of her Cinderella story but you have never heard the intimate details of her often bumpy road to fame and fortune. In this memoir, Paula Deen speaks as frankly and intimately as few woman in the public eye have ever dared. Paula’s story is proof that the old-fashioned American dream is alive and kicking, and there still is such a thing as a real-life happy ending. 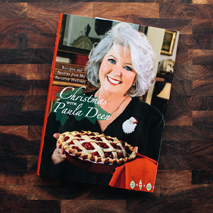 This collection of Paula’s beloved holiday recipes and stories interspersed with cherished family photographs is sure to be a treasured holiday gift. Filled with Paula’s trademark Southern charm and happy reminiscences of Yuletide seasons past. Included are Paula’s most requested homemade gifts of food, a collection of cookies sure to become your family’s favorites and of course spectacular cakes, puddings, pies and other sweet holiday treats. 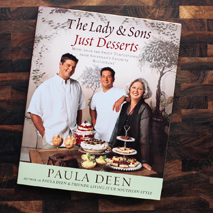 In this beautiful hardcover edition of The Lady & Sons Just Desserts, Paula devotes her trademark southern charm to a tempting collection of more than 120 delightful recipes, guaranteed to indulge any sweet tooth. Whether you’re baking for the holidays or an after-dinner treat, there are crowd-pleasers here for any occasion. 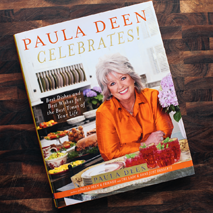 Paula Deen loves a party and she shares how she celebrates a year’s worth of holidays and special occasions. New Year’s Eve Brunch, St. Patrick’s Day, Easter dinner, Paula’s Cinco de Mayo Fiesta menu, a Mother’s Day Tea, and a Father’s Day Boating Picnic. Gather the family to watch some football and savor Jamie’s Cheeseburger Pies, and give family and friends the gift of a sweet treat at the holidays with Paula’s delicious recipes. Paula shares her most private thoughts in a special feature—Paula’s Pearls of Wisdom—which you’ll find with each menu. Entertaining Southern style is about much more than the food, it’s about spending time with people you care about. Paula and her friends are the experts when it comes to creating easy to prepare meals, so you too, can relax and enjoy the fun with your guests. 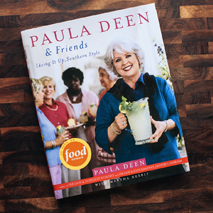 In addition to 150 delicious recipes each chapter is filled with helpful tips and time-saving techniques, as well as memorable cooking stories that inspire Paula. 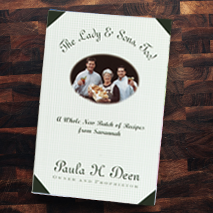 Two of Paula’s cherished culinary classics – The Lady & Son’s Savannah Country Cookbook and The Lady & Son’s Too! – have been combined into one delicious volume. As a special treat, Photos from Paula’s wedding to Captain Michael as well as scrumptious new dishes from the reception. Here are hundreds of mouthwatering, easy-to-follow recipes. 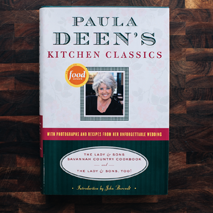 Seasoned with Paula’s practical kitchen hints, and her friendly no-nonsense observations, this book is the perfect gift for experienced cooks, budding chefs, and anyone who loves all- American comfort food.